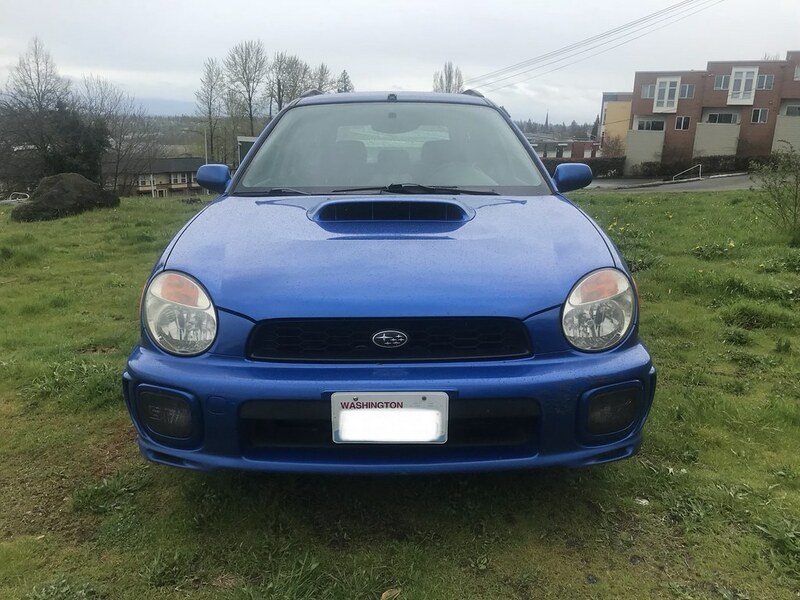 Selling my beloved custom World Rally Blue Bugeye WRX – my lifestyle is no longer compatible with having/using this car. It brings me great sadness, but it just sits, which is also sad. I worked very hard to get it exactly how I wanted it, and now it doesn’t get used. It needs to be enjoyed. 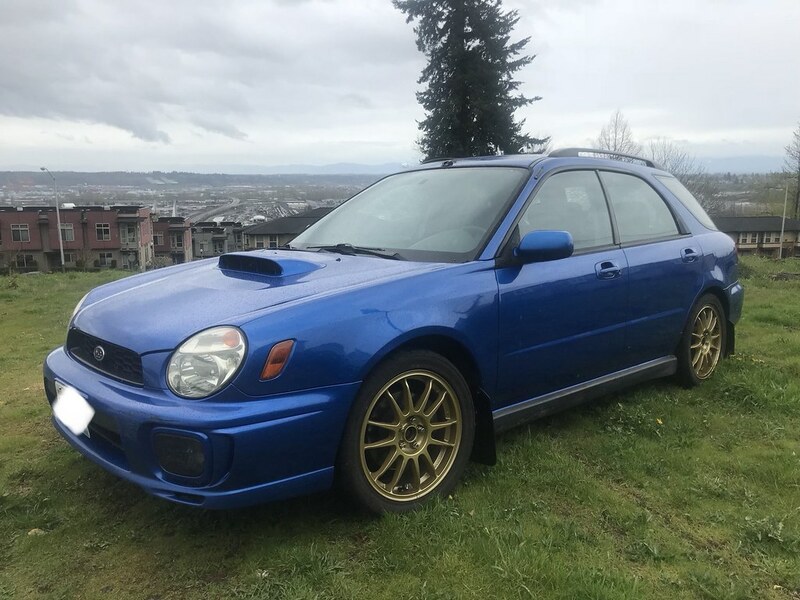 Since this is a nearly new build with no issues, if I don’t get the right price, it’s worth it for me to keep it in event that I might race it in the future, or just take it for a fun spin from time to time. 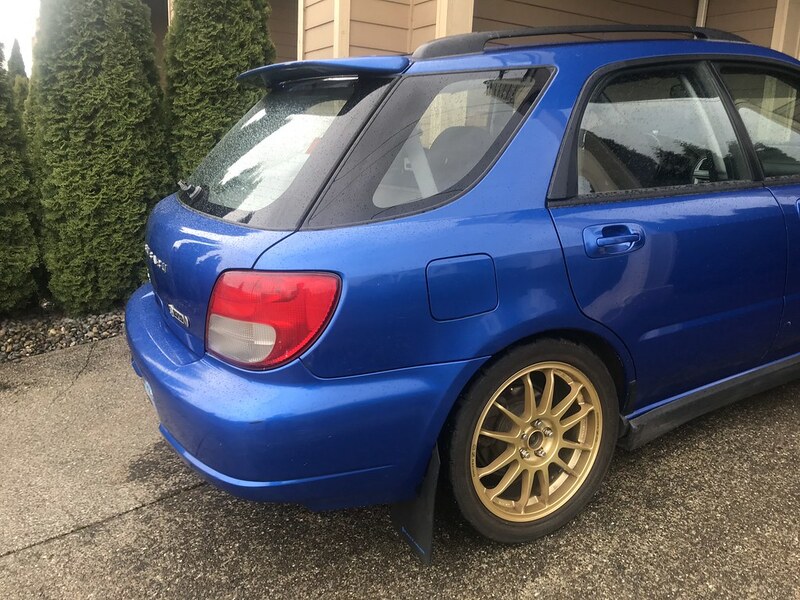 I built this car up with the intent to be able to daily drive a car that is competitive in Modified AWD class for Rallycross. With minor modification, it would be very well suited to Autocross, and with a cage and seats, STAGE RALLY! It was built to be fast and fun. It was not build to spool up at 6k RPM, and otherwise lag like a 90s internet. 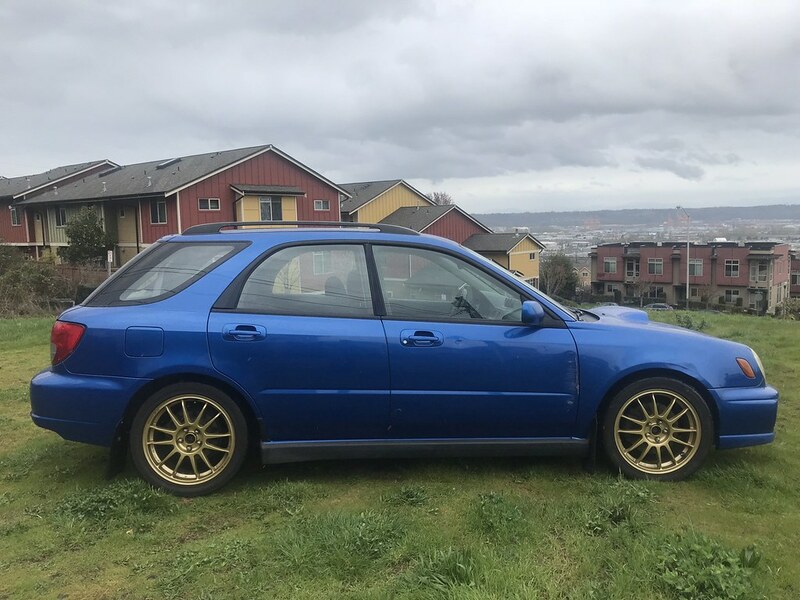 It was built to be quick off the line, and reliable, even for Rallycross (through a rigorous process of trial and error). This build can make significantly more power, but I wasn’t comfortable pushing it since I wanted it to be as reliable as possible (that’s a theme you’ll see with my build choices). All the major work was done by Suba Performance in Denver, CO. They are an excellent shop and highly recommended (in Colorado). 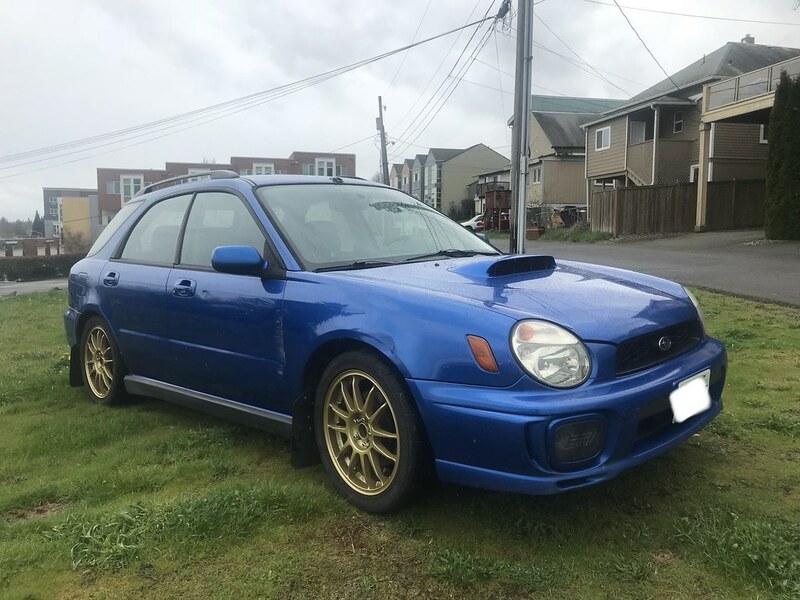 I haven’t had anything done to it since Suba put in the new engine, except new injectors, O2 sensor, & plugs prior to tune per tuner recommendation. 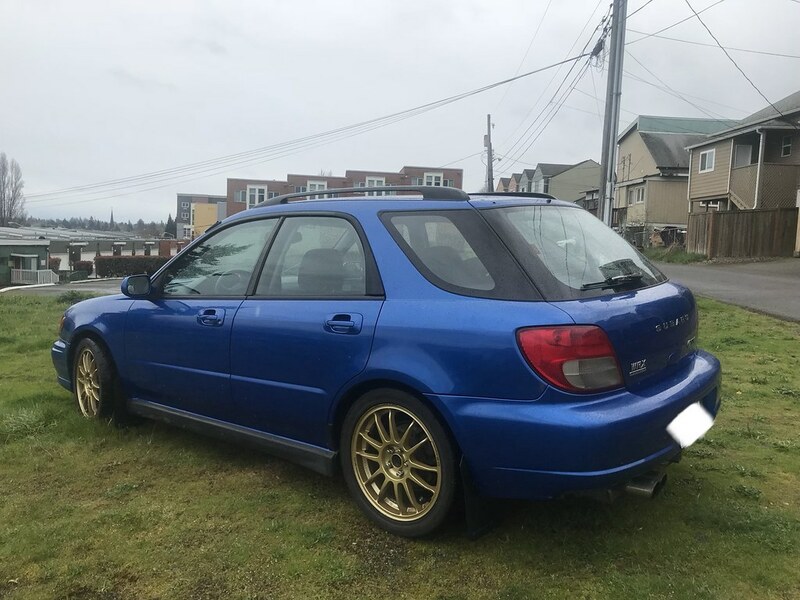 It was trailered to Tacoma, WA, and tuned on new build after break in, by Pacific Import Auto. It has 3 tunes on a Cobb AccessPORT. Car is tuned on pump gas (93). 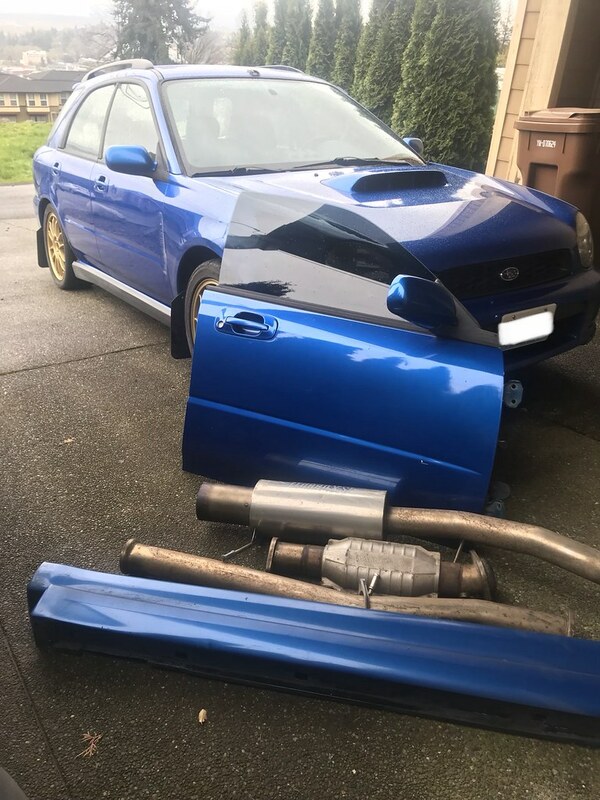 "Performance" makes 329 WHP, 351 WTQ. "In Between" makes 328 WHP, 318 WTQ. "Economy" makes 305 WHP, 287 WTQ. Car can be tuned for E85 and all hardware is in place. I used to run it on E85 when I lived on CO (when engine was a hybrid before I upgrade to a brand new full EJ257). E85 brought the hybrid from 284 WHP/288 WTQ on 91 to 345 WHP/388 WTQ (E85 alone gained 61 WHP & 100 WTQ!). Peak Torque @ ~4000 RPM. If you have access to E85, do not hesitate. For the record, I think peak WHP/WTQ is a suboptimal way of demonstrating the capabilities of an engine. The area under the curve within the normal operating RPM would be a better measure, but I guess as a society we’ve chosen to go with peak values, and people put huge, laggy turbos in cars just to make bigger numbers, and they’re boring to drive right up until they kill you. Not my cup of tea, not this car, though if you want, you could put in a larger turbo and retune it, and make 500/500 if you wanted. I may be convinced to part with my Braid Winrace Acropolis T Gravel rally wheels with Hankook R201 gravel tires incl. 1 new spare, but these are not included in the price. I also have a TurboXS full exhaust with high-flow Magnaflow cat (from the downpipe) that can be included for the right price. 4” Titanium tip that’s pretty baller, but this exhaust got me a ticket so I switched to Borla Hush. 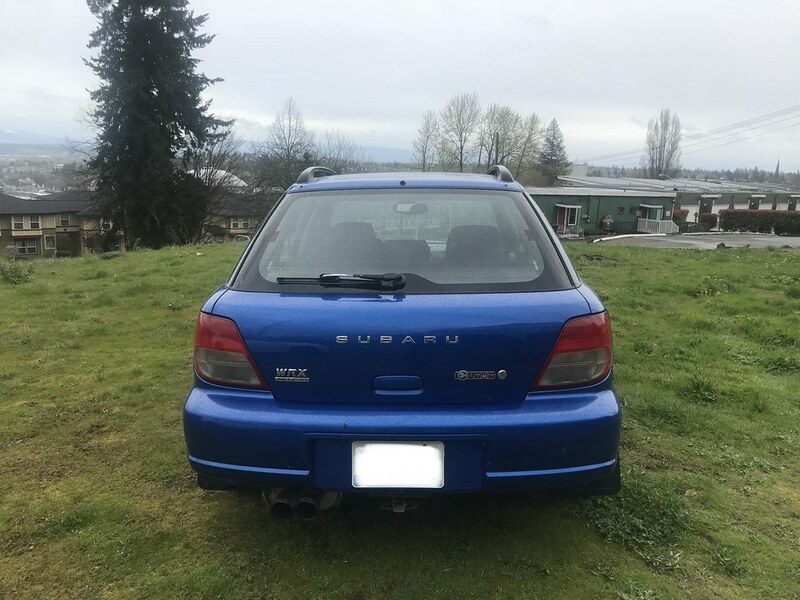 If you want them, I also have a stock exhaust, spare oil pump, 2.0L short block (in which I spun a rod bearing, leading to this build), and stock steering rack. Builder replaced the following at time of new build: OEM headgasket, timing belt, timing belt tensioner, cog idler bearing, smooth idler bearing, small idler bearing, water pump, water pipe assembly, oil cooler, oil cooler hose, valve covers (outer and inner), intake and exhaust manifold gaskets, downpipe and uppipe gaskets, cylinder block seal, PCV and hoses, front crankshaft seal, camshaft seal, rear main seal, oil pump seal, valve covers, oil sending valve, and a bunch of tiny little bits. Engine, transmission = 10/10. Perfect, no issues. 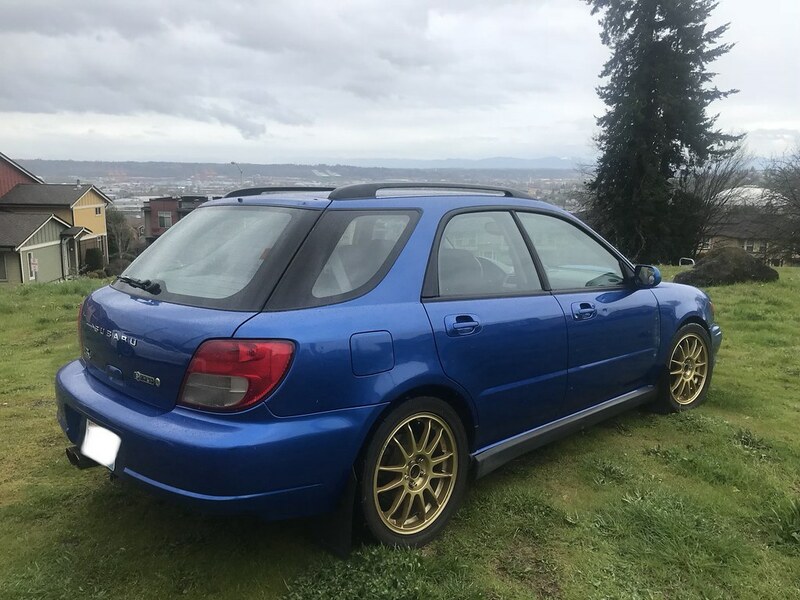 Raced one Rallycross and driven 2,025 miles total since tune, 3000 total on new engine. Interior – 7/10. No visible issues or major damage, nothing needs fixing. But it is a 2002 car, and shows signs of use. Far from trashed. Exterior – 5/10. Most of the car has no issues (minor scratches from use, including rock dings, minor scuffs/scratches), but there is damage to the right front from a bad Prius driver, and concrete pole. Dent/scratches on RF door, so sale includes a spare complete RF door in same color (WRB). RF fender also has dent that could be repaired or replaced. Wagon fenders are easy to find. The damage was annoying enough to me that I bought a spare door for it, but never got around to replacing, or sourcing fender. The fender well liner is worn a bit from the rally tires due to the wonderfully high caster from the Com-C tophats and JDM control arms. I did always care for the exterior well, but it’s not a show car. It’s a race car. This car is easily capable of winning at rallycross. I was always on the podium when I used to actually race in Colorado (<10 races in the past). With a better driver, winning is feasible. If you were to put seats, harnesses, and a cage in it, you could race this in rallysprint or proper stage rally. That was always the dream, but my dream is fizzling, sadly. Yours doesn’t have to. Total cost for this build was just shy of $40,000 not including the labor to install suspension upgrades, stereo, and other numerous bolt-ons/upgrades. 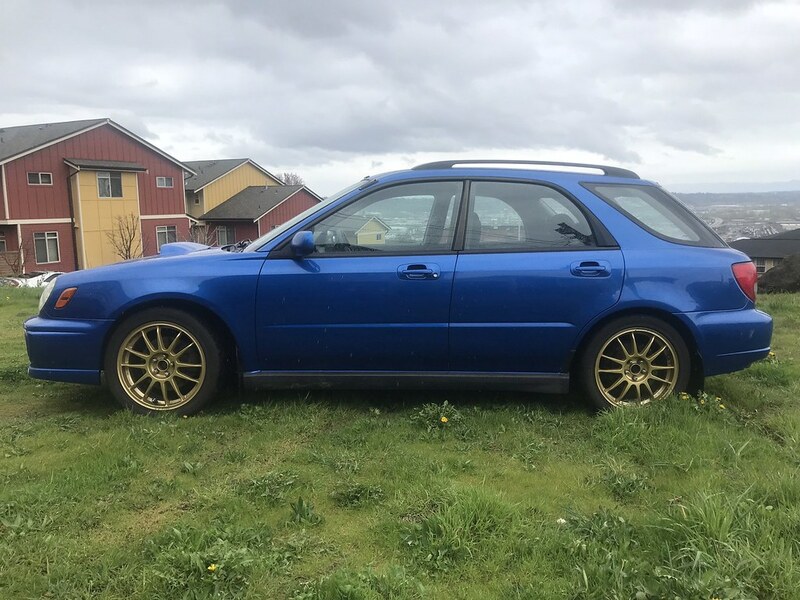 I recently saw a similar STI with a cage, bucket seats and gravel-specific suspension sell for $28,000, but it wasn’t a new engine build, didn’t have a high-end stereo, or 2 sets of wheels, but otherwise pretty similar. I think $25,000 is fair, considering the significantly upgraded, exhaustive, and new nature of this build. Feel free to make me an offer if you feel differently. Just trying to get out of it what I JUST put into it. You cover the cost of the recent engine build, tune, and related work, and get the majority of the car for FREE. Just dropped the price to exactly what I JUST put into the new build only 3,162 miles ago. Pay for new engine build + related parts & tune, get most of the car for FREE. Would you rather buy this, or play "I'ma buy a cheap forum find and play 'what will break next' detective on someone's abused, failed experiment that they're now offloading for a few thousand less"? ?